We retired the Suffusion Theme in July 2015 This means that the theme will still work for blogs that are already using the theme. We will be disabling the theme completely in the future. At that point your blog will be set to use another theme, probably TwentyFourteen. This will change or break some functionality. We would advise that you change your theme before then. At the time of writing (July 2015) we anticipate adding some new themes that will hopefully compensate for the loss of Suffusion. You may want to wait until they appear before deciding on what theme to move to. Suffusion was a very complex theme, here we are only, initially, covering some basics. Please get in touch if there is specific feature you are interested in. Here are some notes on moving a Suffusion blog to TwentyFourteen. The plan was not to replicate all of the features of the blog but to preserve most of the functionality. 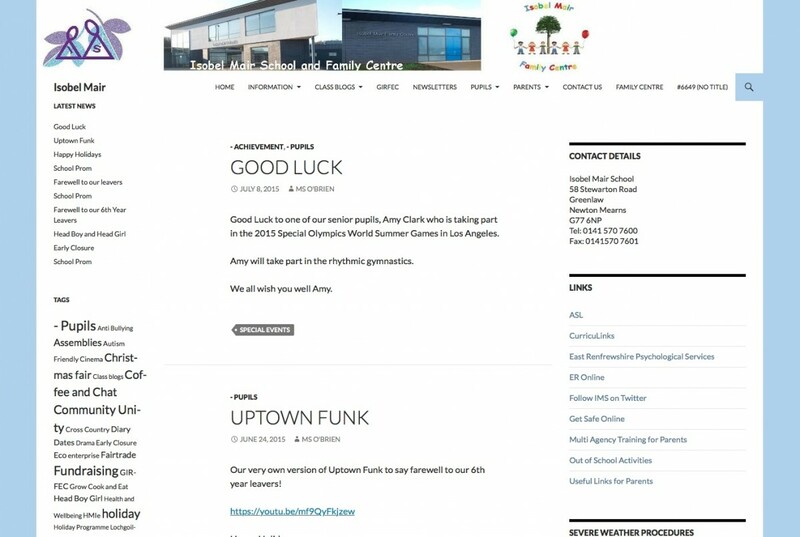 The site was a reasonably simple one set up as a School website. Before we changed themes, we took some screenshots and a note of the menus and widgets. Switch Theme to TwentyFourteen: Dashboard-> Appearance. Turned on the Fourteen Colors and Jetpack plugins. Dashboard -> Plugins. Activated the Custom CSS, Extra Sidebar Widgets in the Jetpack settings: Dashboard->Jetpack->settings. It is worth turning on or considering turning on the Carousel, Shortcode Embeds, Sharing and Widget Visibility Modules too. In the customiser, set a different sidebar and accent colour. You can get tho the customiser from the Admin bar when you are on the site or Dashboard->Customise. Added the Header image back in. Dashboard -> Appearance -> header. The headers for TwentyFourteen are bigger than suffusion, so it is best to add new images of the appropriate size, 1260 × 240pixels. The menus and widgets on this site were not changed except for Suffusion specific widgets. We moved some of the widgets from the left sidebar to the right to give the site a more balanced appearance. Suffusion supports right hand sidebars, TwentyFourteen both. The suffusion Twitter Widget, this was not use on this site, but can be replaced by the Jetpack Twitter Widget. If you use the more complex features of Suffusion, particularly the layout ones you may not be able to replicate these features with TwentyFourteen. If you need a two column sidebar Yoko may fit your needs. We intend to add some more complex themes to Glow Blogs before Suffusion is turned off completely. You may be better waiting for these to arrive than switching now. Please get in touch if you need help or advise. Also let us know of any particular suffusion them you depend on. I have created a school website blog using Suffusion. Do you have a date when this will automatically change to another theme? Also will other more complex theme be added? I want to have the opportunity to explore other themes to find one that meets the needs of the site I have created. Thanks in advance. We said when Suffusion was withdrawn as a theme to choose that it would be removed completely in 2 years, unless security or performance issues made it more urgent. You can read about it. TwentyFourteen along with Jetpack can so a lot, it is very customisable. You may find Example School Sites | Glow Blog Help useful. We hope to have a few more themes in place very soon. Thanks John. I’ll check out the sites you have suggested. I’m in the process of creating a website for school and I liked the layout I could create with Suffusion. I’ll play about with TwentyFourteen to see if I can create a similar look. Cheers! This is the third time I’ve written this comment – not sure if I’m reaching the correct place? I switched from Suffusion to 2014 theme recently for our school website. I put on the Twitter embedded scroll widget to feed our Twitter account directly into the blog, However to do this I had to make the Tweets unprotected. We now realise this isn’t safe and I have removed the widget. 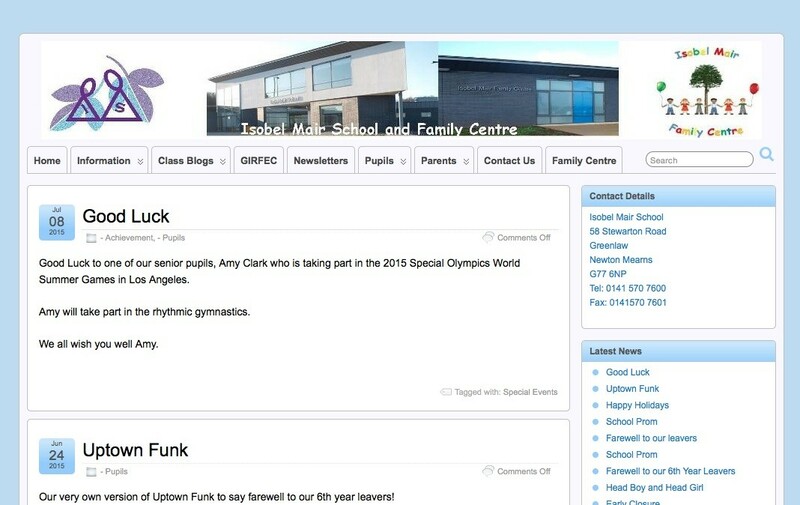 Is there any way to have protected Tweets on our school website in 2014 theme? sorry you are having trouble with the comments here. If you do have problems with blogs you can always follow the advice on the Support page. I think this is not down to the blogs but they way twitter works. You should not be able to display protected tweets to the world? Drop me a mail at gw09johnstonjohn4@glowmail.org.uk if I’ve picked this up wrongly or you think I can help more.